Since it was founded in 1992, RACER magazine has brought together the world's leading motorsports journalists and photographers to provide its readers with an insider's perspective on racing's intoxicating blend of people, passion, speed and technology. The Magazine by Racers, for Racers. The RACER mission is to create compelling high-quality original content that reflects the full spectrum of emotional, physical and technical aspects of racing’s vibrant culture and passionate way of life. RACER views the motorsports world as a global culture with a powerful, winning spirit. 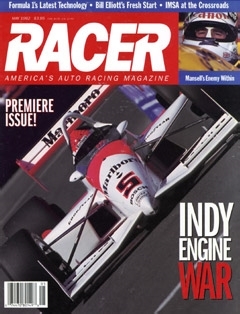 RACER magazine is intended to be a cultural artifact and symbol of excellence to the sport it defines. The RACER brand isn’t about what happened last week or last month. It is about understanding who and what is important now and influencing what will happen next. RACER.com is intended to deepen the connection to racing culture by covering news and events as they happen and adding perspective and insight no one else can.